Note: for more description and additional images and videos of these projects you can click the linked titles below each image, or the list of links in the left side bar, for all my works chronologically. This is a new series of performance works and videos begun in 2018, during a residency in Yerevan, Armenia. I created a field research scientist character who obstinately and naively attempts to prove that political borders do not really exist. “Walks for Decolonization” Series of collective guided performative walks. 2017. 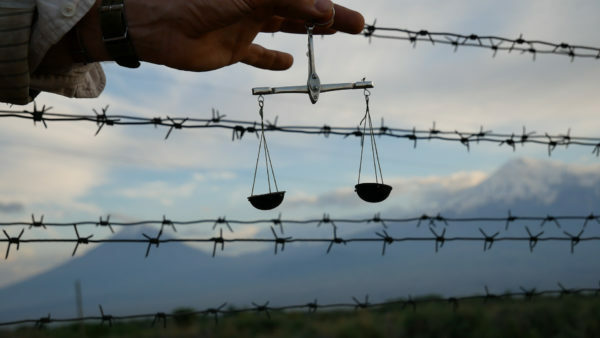 I organized these walks and led participants on an experience of banging fences with sticks, light trespassing, and related discussions, as a way of thinking together through an embodied practice about the private property legal regime that we live under in this colonized world. 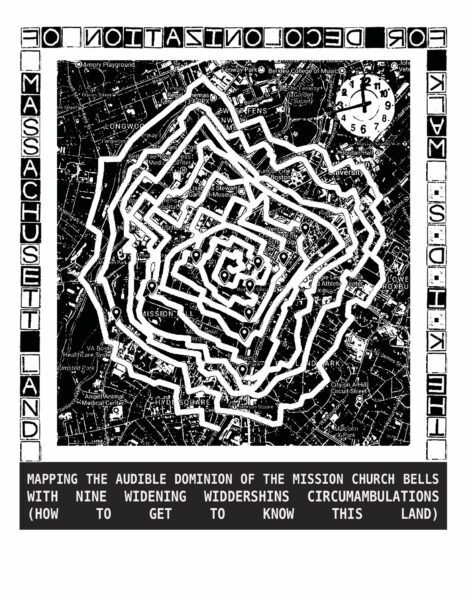 “Mapping the Audible Dominion of the Mission Church Bells.” Self-organized Social/Public Project. Produced in Collaboration with a group of students at Emmanuel College. 2017. Description: On August 3rd and 4th, 2017, I performed a 26 mile walk, which I have mapped out here, circumambulating nine times counter-clockwise around the beautiful Mission Church in the present-day Mission Hill neighborhood of the traditional homeland of the Massachusett people (greater Boston, Massachusetts, USA). At the time I was living in the neighborhood, as a resident artist at Emmanuel College, a private Catholic liberal arts school. 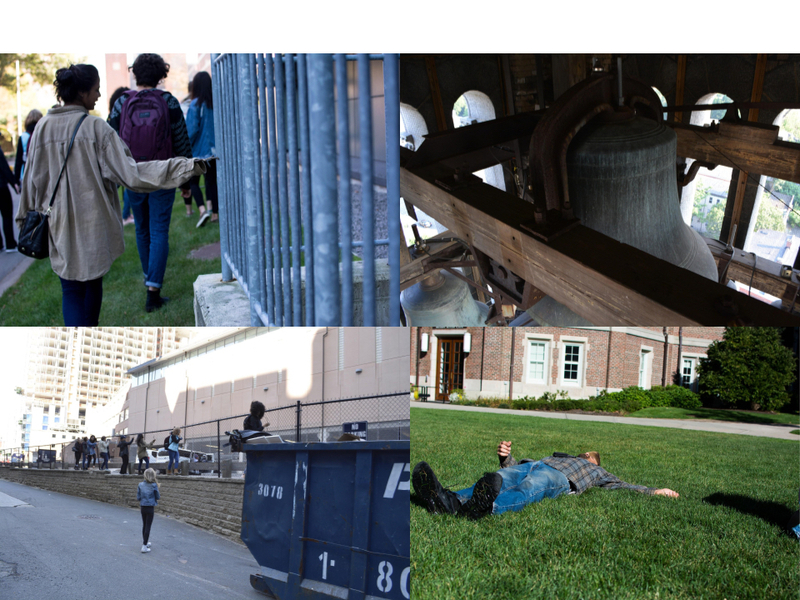 My idea was to map the sphere of influence of the church bells, as a way of thinking critically and experientially about the ongoing colonization of indigenous lands by settler societies. The resulting video documenting the walk became part of a didactic educational installation in the hallway of Emmanuel College, about the Doctrine of Discovery and Indigenous Peoples’ ongoing struggles for sovereignty, self-determination, and fundamental human rights. “The Tree Spa for Urban Forest Healing,” Self-Organized Social/Public Project with numerous collaborators and participants. 2014-present. Description: Over several years I have become proficient at cutting edge maple sap gathering and processing techniques, and I use this wild, magical natural resource as a medium for artistic expression, collaboration, and civic engagement. 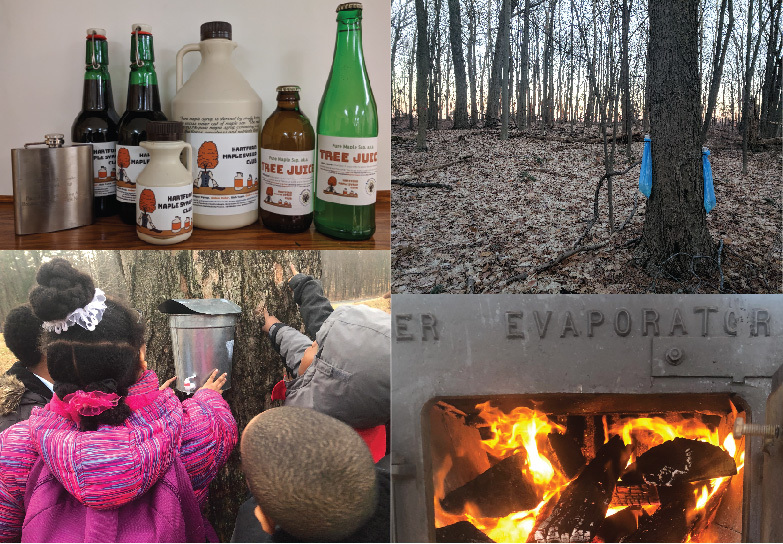 Currently I am collaborating with the Keney Park Sustainability Project in the impoverished North End of Hartford, Connecticut, to tap the trees in the park and develop a series of events and activities to share and enjoy tree sap with folks in the neighborhood. 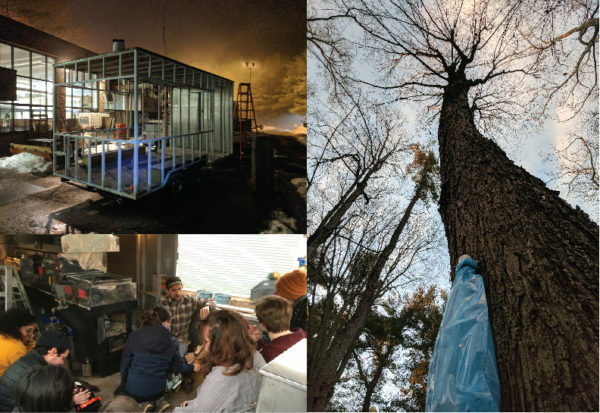 The latest development is a functional steamroom that uses the steam resulting as a byproduct of the maple syrup evaporation process, to create a space for healing, conversation, and reconnecting with the land. 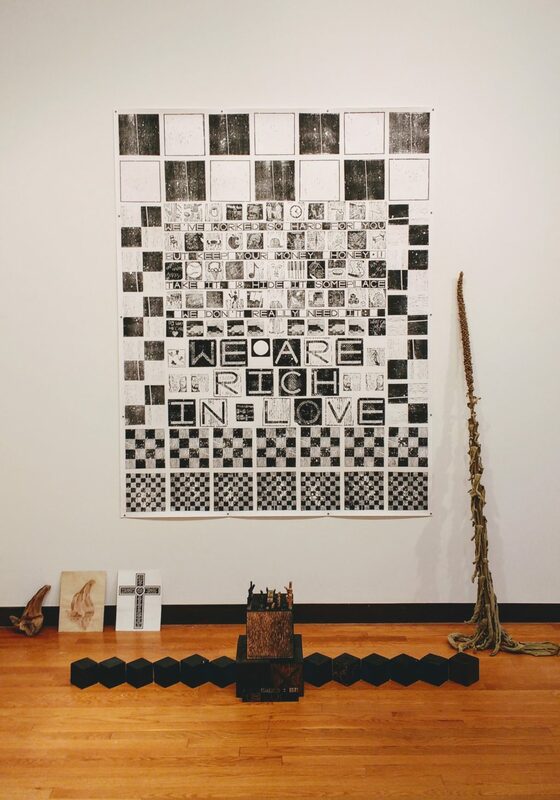 “We are Rich in Love,” Installation, dimensions vary (print: 5′ x 8′). 2016. Description: This printed work was made using a collection of hand-carved and engraved blocks including a personal iconography of images and an alphabet in two different scales. The installation includes a variety of meaningful natural objects in addition to the blocks and the print. with visitors. This somewhat absurdist collection of objects, videos, and situations presented a sparse and foreboding scene for participants to explore. “A Boat to Find Christine Periord,” Self-Organized Social/Public Project. Dimensions of boat 6′ x 3′ x 2′. 2013. Description:I made a small skin-on-frame boat as a magic tool for exploring my cultural heritage. 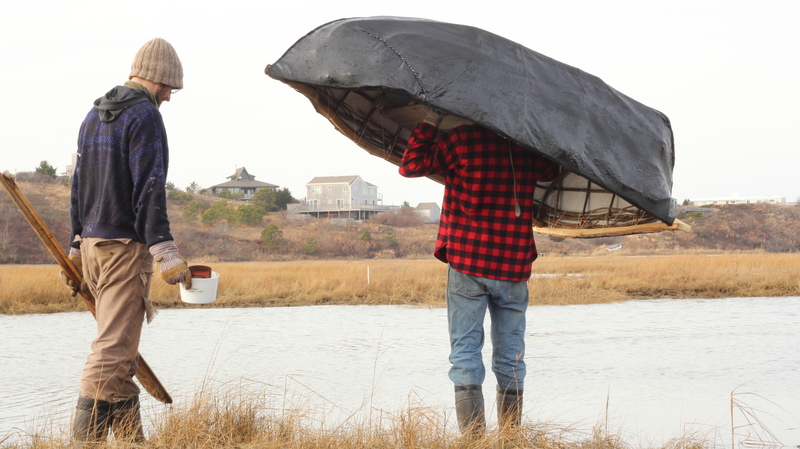 At the time I was in retreat from the world, in isolation at Phat’s Valley Residency in Truro, Cape Cod. 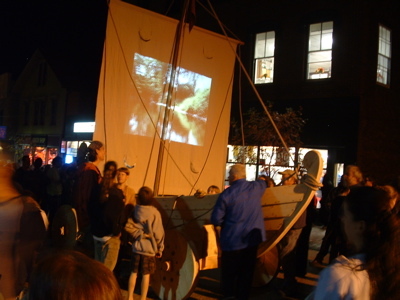 The boat was launched at a public event and was later used for exhibitions and events in Connecticut. “Dead Branch Memorial Tree Guards and Wild Tea Parties,” Social/Public Installation/Performance, 2012. 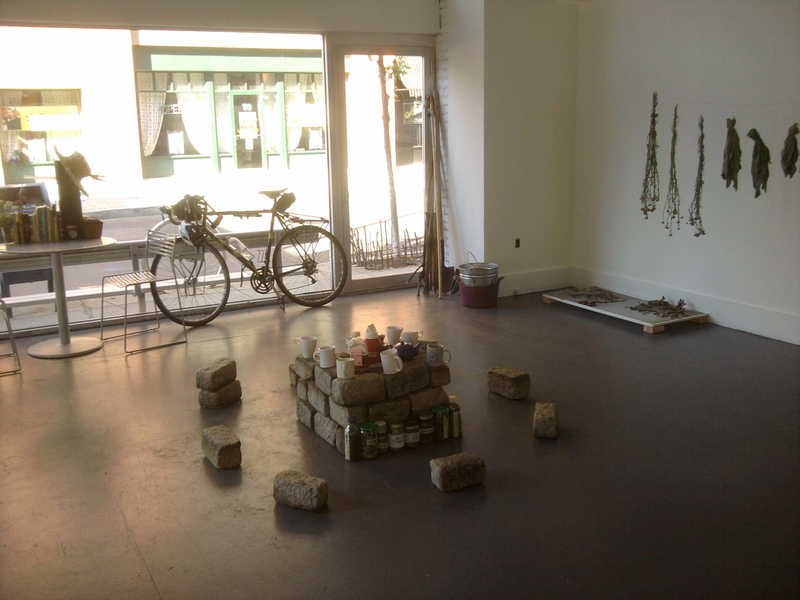 Description: I made tree guards for the poor dying street trees outside of this gallery space, and appropriated the cobble stones crowding their roots for this gathering space for drinking tea infusions made from plants foraged in the surrounding city’s wild spaces. “Cloud City,” Social/Public performances and installations, in collaboration with Huong Ngo and participants, dimensions vary, 2010. 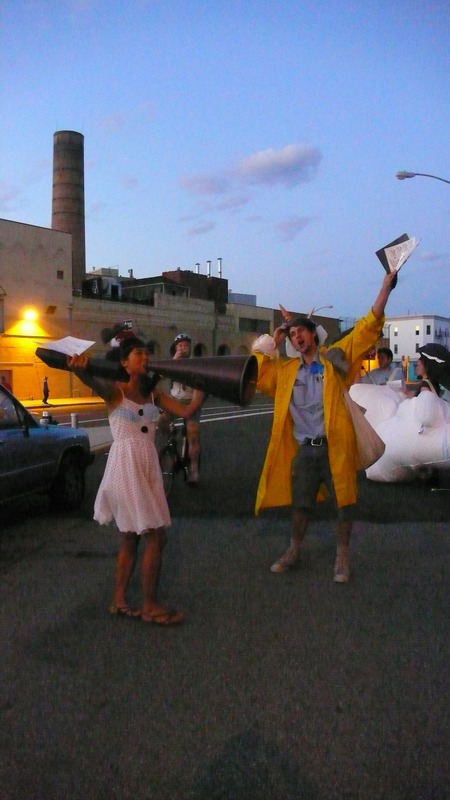 Description: We made a number of inflatable sculptures, mobile structures, props, and costumes, and presented an imagined utopian city to friends, neighbors, and participants, in a series of performances, exhibitions, and organized parades moving at an impossibly slow pace. 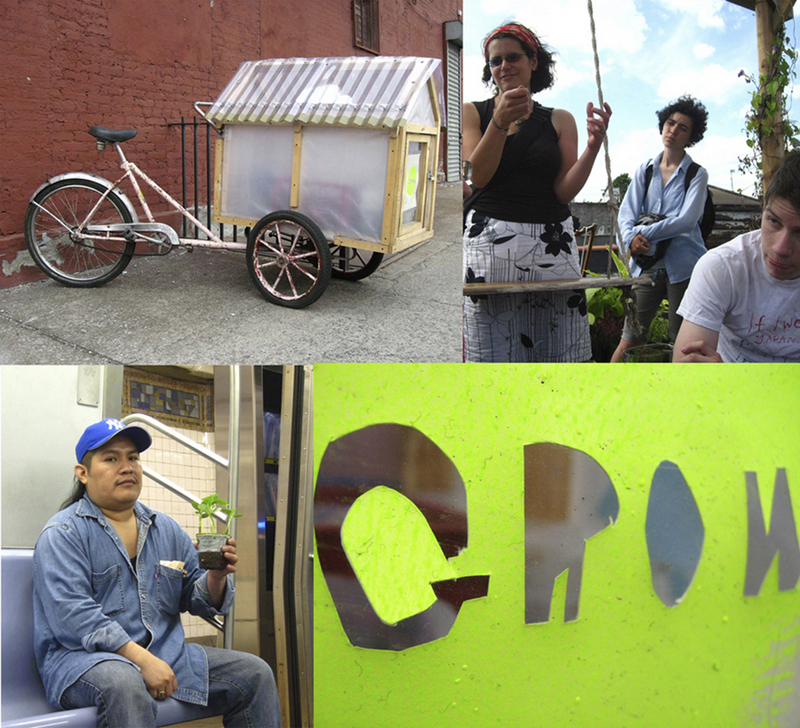 “Growing a Network of Secret Gardens,” Self-Organized Social/Public Project, in collaboration with Huong Ngo and participants, dimensions vary, 2009. Description: This wide-ranging project involved growing a rooftop vegetable garden, as well as several mobile-garden vehicles, and sharing the produce with neighbors and participants, and organizing a series of tours, exhibitions, talks, and other events throughout New York City at various gardens and sites of interest. “Pulling Together the Legends of Willimantic,” Self-Organized Social/Public Project, in collaboration with Ted Efremoff and participants, dimensions vary, 2006-2010. Description: With approximately 100 participants we built a functional wooden boat and trailer in a couple weeks and used them for civic engagement actions related to revitalizing local waterways and developing alternative histories in the impoverished and stigmatized city of Willimantic, Connecticut, near my hometown. “A Sauna – or -Something About Temperature & Time, Memory & Moments, Labor, Leisure & Location, Saving & Sharing, Usefulness & Us.” Self-Organized Social/Public Project, in collaboration with Sam Ekwurtzel and participants, dimensions vary, 2007. Description: We built a Sauna at the Skowhegan School of Painting and Sculpture when we were residents there. 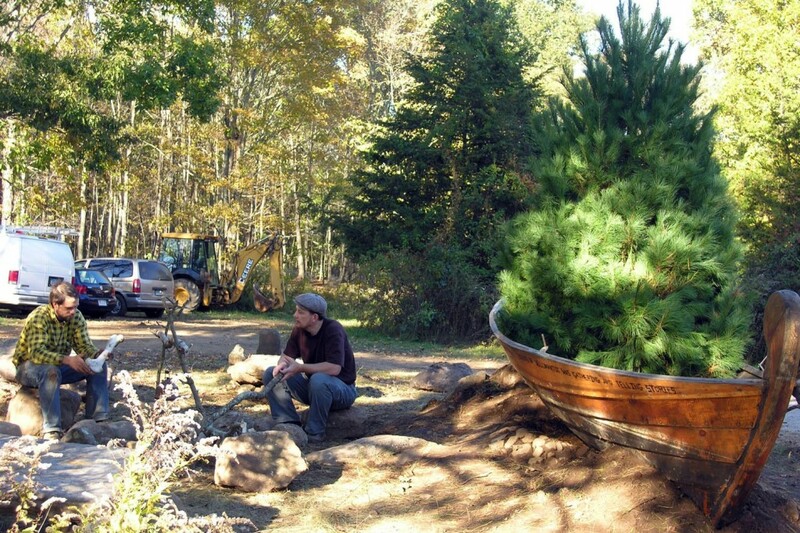 It was a functional wood-fired sauna and we organized a group of volunteers to manage it. It was also used as a site for performances, conversations, and video productions, and became an identifying feature of the landscape at this prestigious residency program for years to come. 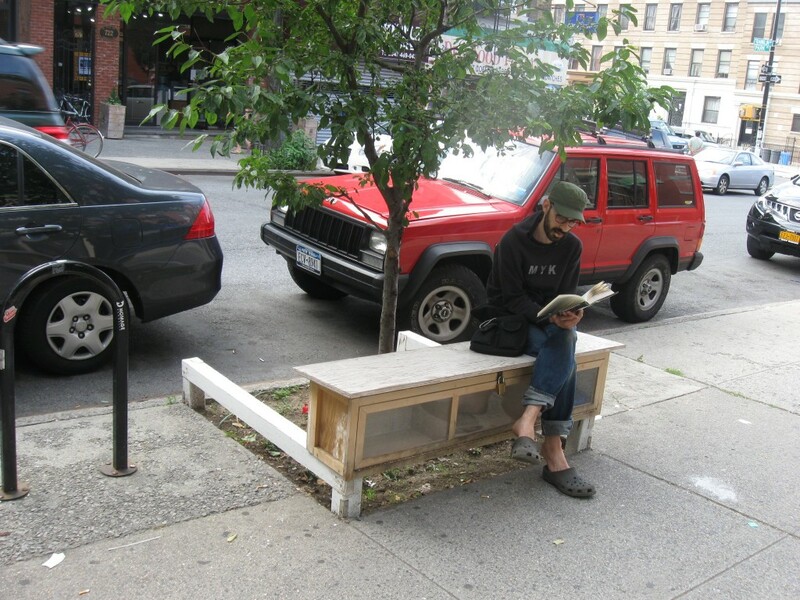 “The Corner Libraries,” Self-Organized Social/Public Project, dimensions vary, 2007-2013. 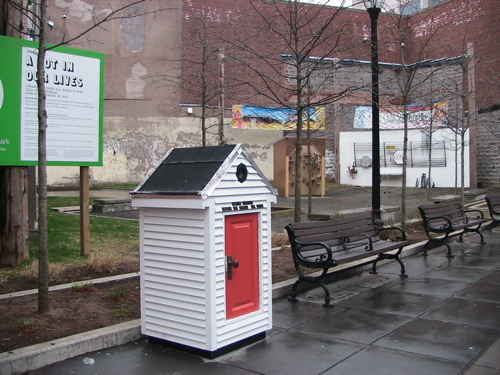 Description: This was a series of uniquely designed small lending libraries in public spaces, each with a librarian and a specific collection depending on the design and context. Each library was designed to make opportunistic use of loopholes discovered in rules of the various regulatory agencies governing the use of public space in New Haven and New York City. “A Lot in Our Lives,” Self-Organized Social/Public Project, dimensions vary. 2007. Collaboration with a variety of participants. 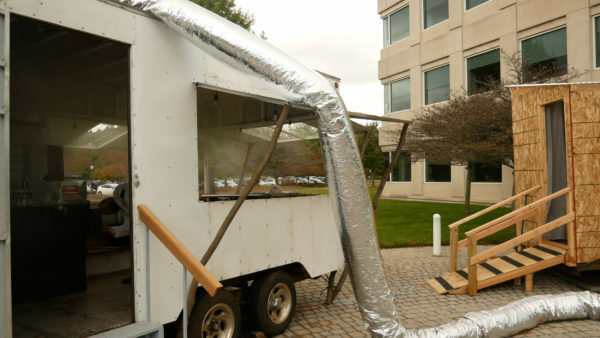 Description: Commissioned by Artspace (New Haven, CT), this was a 6 month-long installation in a public park named the Lot, where there was a bus stop. 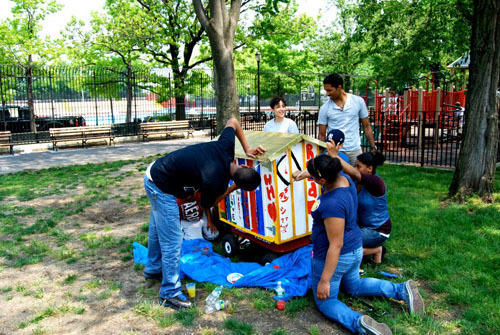 The project included a variety of structures to promote civic engagement and activate the space, including a freestanding wall for writing, a group of homemade musical instruments, a small shed for exchanging personal objects, a miniature lending library (foreground), and a vegetable garden. The creation of A Lot in Our Lives included collaboration and input from many people. Frank Brescia, Robert Hurd, Henry Loomis, John Singer, Steve Tarquino and Kristina Zallinger co-produced the “Elm City Sound Relief” and collaborated on the design and production of the four hand-painted banners on display. Other artists from Artship of Fellowship Place were also involved in brainstorming and preliminary discussions. Frank Brescia, Henry Loomis and Kristina Zallinger also contributed their energies to “The Lot Garden Plot.” George Newman and I collaborated on “The Citizens’ Collection Cabinet,” which also received input from Huong Ngo and Ted Efremoff. George also worked on the freestanding black and white wall for writing, as did members of Artspace’s Teen Docents program. There have been other contributors who wished to remain anonymous. 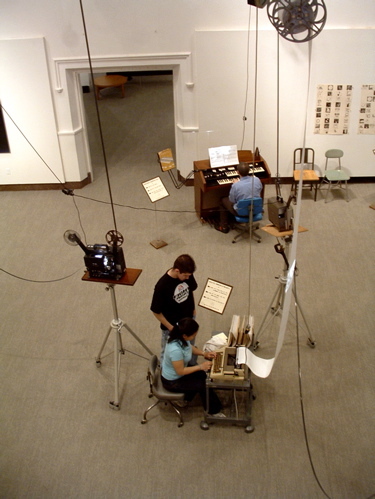 “MOBILIZE: The Moving Picture Show,” Self-Organized Social/Public Project, dimensions vary, 2005-2008. 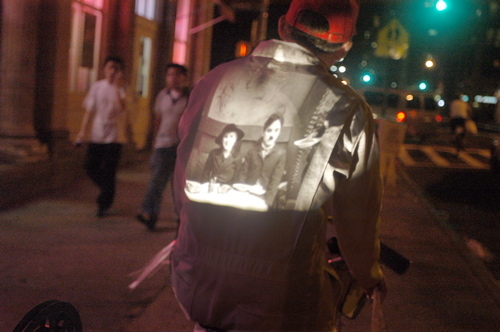 Description: This project involved projecting 16mm films, often by Charles Chaplin, onto my back, while riding an adult tricycle around the neighborhood, causing impromptu parades of viewers, conversations, new friendships, collaborations, and promoting an active lifestyle. “MOBILIZE: The Portable Pantry,” Self-Organized Social/Public Project, dimensions vary, 2008. “A Work of Art,” 16mm film/Performance/ Printed Matter / Participatory Installation. 2005. Description: This was my MFA thesis exhibition. I shot and manually edited an original 16mm film and installed it hanging in the air as a sculptural material. The film was running through two projectors, projecting onto a couple of interactive situations for participants to activate with their creative work. Throughout the month-long run of the show, I worked the regular hours of the museum as a performative attendant for my project, engaging freely with visitors to the space and collaboratively producing block prints with those who expressed interest. In addition there were free copies of two original artist books that I had made in large editions for visitors to take home.